On February 4th, members of the Drug Enforcement Agency High Intensity Drug Trafficking Area Task Force, of which the Webster Police has a detective assigned, developed information pertaining to a suspicious package being delivered to 36 Lake Street apartment 5 in Webster. Webster Police, along with the both the members of HIDTA and the South Worcester County Counter Crime and Drug Task Force conducted an investigation, and delivered the package to the address. The package was picked up by a male, later identified as 30 year old Alexander Torres of 36 Lake Street. Police followed Torres and he was eventually stopped in Dudley. He and his vehicle were eventually brought back to the Webster Police Department, after Marlborough K9 Officer Ken McKenzie and his partner Kaiser, had responded to the scene of the stop. Kaiser alerted for the presence of narcotics inside the vehicle. Once at the station, a search warrant for the vehicle was obtained. At that time the package was opened and inside was what appeared to be a kilogram of pressed Cocaine. A search warrant was then obtained for 36 Lake Street #5 at which time more packaging materials consistent with what police had already recovered, 200 rounds of various calibers of ammunition, 3 digital scales, a hydraulic press used for pressing kilograms into bricks, and 13.5 bundles of what police believe was Heroin. The value of the Cocaine was believed to be $42,000, whereas the Heroin was estimated to be worth $400. 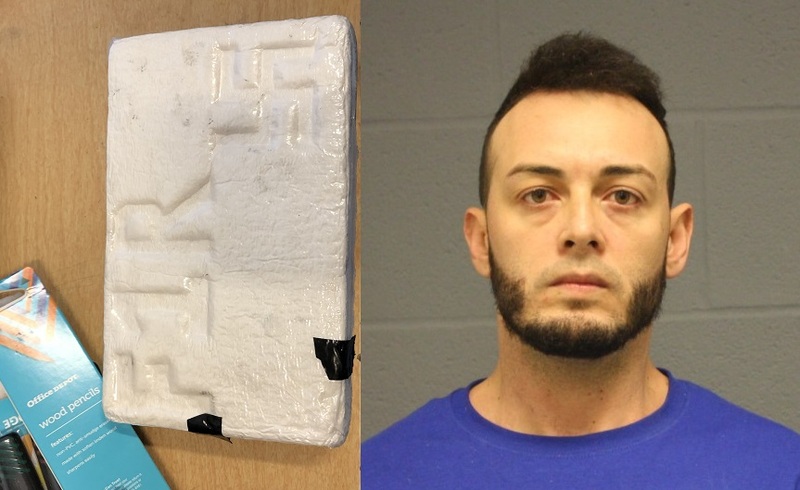 Torres was charged trafficking in cocaine over 200 grams, obstruction of justice, possession of ammunition without an FID/LTC, improper storage of ammunition and possession of a class A Substance with the intent to distribute. Torres was held on $25,040 last night at the Webster Police Department and will be arraigned at Dudley District Court today.